Three weeks ago, my commentary on peer counseling for combat trauma – and the connection to American Sniper and former SEAL Chris Kyle – appeared in the Santa Rosa Press Democrat’s Close to Home column. A reader responded: Yes, many veterans suffer from PTSD and other emotional challenges and need and deserve help. What about the partners, spouses, and family members of struggling veterans? We’re suffering, too, in our own ways. This loving partner of local veteran is absolutely right. I won’t reveal her name, but she has really hit the nail on the head. Loved ones of veterans and service members struggling with behavioral health issues need information and support. They need help to take care of themselves so that they in turn can take care of the veteran in their lives and any other family members depending on them for care. My respondent asked: Did I know of any support groups for loved ones of struggling veterans? I’m a man of action, and now I’m acting. I’m in the process of forming the kind of group this loving partner needs. I’m also involving our affiliated nonprofit, Sonoma Coast Trauma Treatment (SCTT) to help make this group a reality. Part of SCTT’s vision is to provide emotional trauma-related services and support for local veterans and their families. This new support group fits squarely into their mission. It also fits squarely into my passion to give back to the military men and women and their families who have sacrificed so much for us and for our country. We are now forming the Support Group for Loved Ones of Veterans with PTSD. If we can help you, or if you know of someone who could use our help, or if you would like to contribute financially to this outreach, please contact us. You will have my deepest gratitude. For more information about SCTT and our new support group, please contact either myself or group coordinator Hilloah Levy, at 707-781-3335. In 2014, George Bush will run for the office of Texas Land Commissioner. He’s campaigning already, according to a recent article in the Mid-Valley Town Crier, and, as a veteran, he has plenty to say about PTSD and other issues regarding military service. Julie Silva’s Crier article first caught my eye for an obvious reason—is Former President George W. Bush running for Texas Land Commissioner? After my double-take, I discovered that US Navy Reserve Ensign George P. Bush (and nephew to our former president) is actually the commissioner-hopeful. The next reason for my interest in the Crier article is a debate about PTSD that arose during Bush’s visit to VFW Post No. 7473 in Elsa, Texas. George Prescott Bush served in Afghanistan in 2010 as an intelligence officer. On returning to the homefront, he explained to his VFW audience, his greatest concerns for fellow veterans were the high rates of suicide and unemployment, as well as providing increased access to education. But a member of the VFW audience objected to Bush’s statement. “Many times we have a hard time getting our benefits and the last thing we need is for somebody to say that PTSD is not permanent,” a Vietnam veteran responded. “A lot of times PTSD doesn’t hit you until years later.” Bush clarified his stance by explaining that he believes that the condition can be permanent if left untreated. Whether PTSD is “permanent” is a thorny issue and I’m not going to go into all the background for taking one position over another in this post. What I want to highlight today is a point I make in my new book, Trauma: Healing the Hidden Epidemic. There is a crucial difference between “healing” and “a cure”. In short, I believe there can be healing for post-traumatic stress disorder. But there is no cure. Notice my carefully chosen term: healing. Not cure. I suffer from PTSD myself (you’ll discover the multiple sources of trauma in my life as you read my book). And although I’ve done much work to heal my PTSD and the PTSD of my patients, I know there’s no cure. Put me in a particular set of circumstances, in the “right” situation, and I can be triggered into a reaction of violence and rage. And to their dismay and regret, this is true for my patients as well. For them and for myself, getting triggered happens a lot less often than it used to, but it can and does happen. Most of the time, I’m able to stop myself from acting on my violent emotions, but their intensity can still be consuming. Let me say, briefly, that healing PTSD means being less frequently triggered into the past, less frequently confused and overcome with potentially destructive emotions and pain. Healing means being more often in the present, enjoying the sometimes stressful challenges of a fulfilling life and relationships, with fewer debilitating intrusions from memories of the past. No, there is no cure for PTSD. But there is hope. Our veterans can find healing. And if you suffer from PTSD, so can you. Would You Talk to a Virtual Therapist? On June 20th, I attended the day-long “Brain at War” conference in San Francisco presented by NCIRE – The Veterans Health Research Institute, in cooperation with the San Francisco VA Medical Center, UCSF, and the US Department of Defense. Annually hosted by the stately Marine’s Memorial Club & Hotel, “Brain at War” reports on the “ongoing examination of the physical and neurological consequences of military combat duty”. Experts in medicine and science present “the latest innovations and emerging technologies” in the understanding and treatment of PTSD, TBI, and other brain injuries associated with combat experiences. Some of the presentations were of great value. Caroline Tanner, MD, PhD, the Director of Clinical Research at the Parkinson’s Institute, gave a fascinating overview of Parkinson’s disease and its possible relation to brain injury and exposure to toxic chemicals. My father died from complications of Parkinson’s, and while I was familiar with some of the information Dr. Tanner presented, some of her material was new to me. Robert Obana, Executive Director of NCIRE, graciously included me at a lunch table where I was able to meet several presenters and other important conference attendees. We had a lively discussion on many topics, one of which included the day’s most thought-provoking presentation. The presentation came courtesy of Dr. Albert “Skip” Rizzo, the Associate Director for Medical Virtual Reality at the Institute for Creative Technologies, USC. Skip, who obviously loves his job, gave a fascinating overview of his work developing virtual reality applications for military personnel training and treatment. 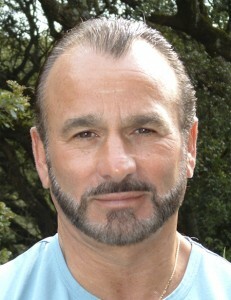 Briefly, Skip’s work involves four areas: first, an intense, customized version of the Xbox game “Full Spectrum Warrior” for PTSD exposure therapy; second, a video resilience training program modeled on a “Band of Brothers” format; and third, a somewhat folksy, virtual-online PTSD mentor-coach, dispensing information and coping skills from across the table on a porch. The fourth application involved the creation of a virtual therapist who conducts a Skype-style counseling session from a comfortable chair. The program uses a fairly young, female image to probe for emotional dysfunction in her real patient by instantaneously tracking patient verbal responses while reading both vocal patterns of distress (by microphone) and visual body language (by web-cam). The virtual therapist is programmed to then respond verbally and physically in real-time to the issues shared by the military patient. “That sounds difficult”, she acknowledges when a veteran reveals a painful memory, and leans forward when her real-life patient leans back. The therapists, social workers, and counselors in the room reacted strongly to this simulation. I felt a visceral dislike for what struck me as a removed and cold treatment approach to the complicated issues and deep wounds of many of our traumatized combat veterans. A “sensitive” machine is still a machine. Won’t troubled service members feel belittled and dismissed if they assume they don’t rate face-time with the empathetic, skilled professional help of a real, live therapist? This chilling prospect was remedied, somewhat, by Lieutenant Colonel Steve Countouriotis, US Army (Ret. ), NCIRE Board of Directors, and fellow resident of Petaluma, in his closing remarks. He brought humanity back into the day and touched me deeply. So, on to the question of this blog post title: Would you talk to a virtual therapist? There’s a possibility, I admit, that feelings of intense embarrassment or shame could make confiding in a virtual, not-real therapist seem safer or easier. I would appreciate it if you’d weigh in on this one. Could you see yourself participating in virtual therapy? Or, do you see it more as I do, as an approach which could oversimplify and disrespect the complex nature of trauma and being human? The United States Senate has designated June 27th as National PTSD Awareness Day. Every day in my practice I’m doing what I can to bring more awareness to trauma and the “invisible wounds” that contribute to post-traumatic stress. It isn’t just the military who suffer from PTSD. Anyone and everyone who has experienced overwhelmingly traumatic events can find themselves suffering from hidden, emotional wounds. Firefighters, EMTs, police, nurses, emergency room personnel, crime victims, abuse victims—all of these and many more are at risk. I’ve tried to highlight issues and misunderstandings about PTSD in my recently published book, Trauma: Healing the Hidden Epidemic. To further contribute to PTSD awareness this day, let me quote from my chapter, “A Note to Veterans and Their Loved Ones”. What I’ve written in this chapter regarding veterans applies to all those suffering from post-traumatic stress. “Post-traumatic stress disorder is just a name for a catalogue of symptoms that follow a stressful situation. Veterans are not the only people on earth with PTSD. Yet the term has a very negative connotation in the military world. Veterans often feel that a PTSD diagnosis reduces the uniqueness of their individual reactions, feelings and struggles. Or they may feel stigmatized, labeled, and devalued by their peers. Let me say that again: PTSD is not a permanent condition. With help, it can be healed. That is the essential message of my book, a message of hope. Of all the awarenesses that could occur on this National PTSD Awareness Day, let that be the overriding one. 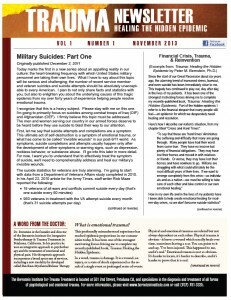 Military suicides happen far too often. 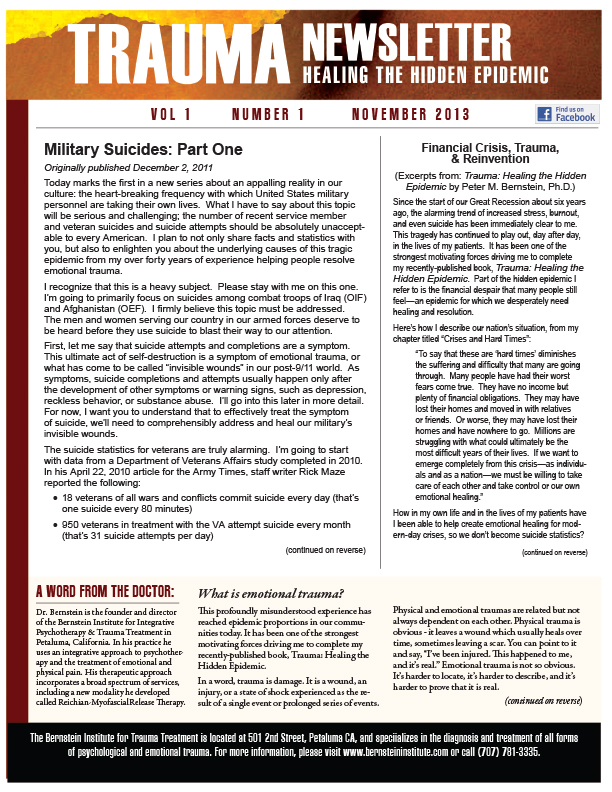 Alarming statistics from studies of suicide by active duty service members and veterans both paint a tragic picture. The years of combat in Iraq and Afghanistan, the multiple deployments, have taken their physical and emotional tolls. Over the last few months, I’ve kept this issue in the forefront of my blog posts. Lately, I’ve highlighted a side to military suicide about which few studies have been done and statistics are largely unavailable: suicide by military spouses. I’ve drawn heavily from the words of two military wives: Ms. Deborah Mullen, wife of former Chairman of the Joint Chiefs of Staff and retired Navy Admiral Mike Mullen, and Kristy Kaufmann, wife of an Army soldier and executive director of the Code of Support Foundation. I’ve reviewed the symptoms of post-traumatic stress (including suicide and suicide attempts), and the inadequate mental health treatment currently available to military spouses. Today I’m going to go into more detail about the stresses experienced by military families. I’ll conclude with Deborah and Kristy’s suggestions for ways the Departments of Defense and Veterans Affairs could better serve the mental health needs of military families. Besides the agony of waiting, other sources of stress for military spouses and families include reintegration and reunion challenges, Deborah explains. “A combat tour may last a year, but the effects of that tour on the service member and family may last much longer.” Spousal and child abuse cases are rising in military families. Families of service members who’ve sustained serious physical injuries may endure long-term relocation to receive treatment, and children “may be left at home with family or friends”, breaking the immediate family apart. 1. Really listen to military families, look at things through their eyes, to better understand their special needs and challenges. 2. Provide “home-centered” assistance for families in crisis, in which counselors and other assistance personnel come directly into the home to provide needed support. 3. Do a better job of following up on the results of programs currently in place. New programs are being created all the time, but too often they aren’t reviewed and modified, as necessary, to become truly effective. 4. Develop a more holistic strategy that integrates military families and community support. Society has a crucial role to play in helping keep military families strong and healthy. As a young Marine wife told Ms. Mullen, “It doesn’t matter if it’s the first day they’re gone, or the last day before they return home, you’re scared all the time. You pretend to be happy, but you’re living in fear.” And, Deborah urges, military spouses should not have to face that fear alone. Through my work, I’m committed to the health and well-being of our nation’s service members and their families. I don’t want them to be left alone to struggle with their issues of emotional trauma and post-traumatic stress. I encourage you to join me, in whatever way you can.